The Amateur Radio Club at Yale, W1YU, sponsored the second annual New England Collegiate Amateur Radio Initiative Forum at the ARRL hamfest this past weekend and the program was a great success. This year’s forum opened with keynote remarks by ARRL CEO Tom Gallagher, NY2RF, and continued with four outstanding presentations by guest institutions. Sean Barnes, N3JQ, from Harrisburg Academy led off the guest presentations by sharing how ham radio fits into the curriculum at this small private school where all physics students earn their Technician license while studying electromagnetics at the high school level. Sean recently compiled a matrix of 329 licensed college amateur radio stations for the ARRL Collegiate Amateur Radio Imitative and he spent a portion of his presentation explaining the methods he used in creating the database and plans for future upkeep and use. Scott Westerman, W9WSW, from Michigan State University gave an absolutely dynamic and inspiring charge to college amateur clubs on many simple things they can do to promote their clubs and increase membership. Unfortunately, Scott’s travel plans were cancelled at the last minute due to Hurricane Irma, but he was able to address the forum via Skype. If you were unable to attend Boxboro, you can hear Scott’s presentation here and be sure to check out his website dedicated to amateur radio club growth here. Following Scott, Capt Matthew Sherburne KF4WZB and the cadets from the US Military Academy took the stage and delivered a presentation on the revitalization of the West Point Amateur Radio Club. Captain Sherburne emphasized the importance of putting cutting edge technology into the club shack when setting up a new station making sure there is an abundance of power to meet all present and future equipment needs. Matt also spoke about the delicacy of installing antennas in historical properties. Cadets Jonathan Morton, K38EBT, Logan Leahy, KD2MWT, Michala Wyrsch and Christina Harris shared their experiences as member of the West Point Club including remote operations. West Point cadet Christina Harris addresses the group during the round table forum. Capt. Matthew Sherburne, KF4WZB (left) listens to comments during the round table. Dr. David Kazdan, MD, PhD, AD8Y, spoke about the role of the faculty advisor in the collegiate club. CWRU club officers Nathaniel Vischner, KB1QHX and Rachel Boedicker, AC8XY. The forum concluded with a one and a half hour round table discussion about the state of college amateur radio, moderated by W1YU President, Scott Matheson, N3NFP. Members in attendance shared challenges and thoughts and ideas about what has worked and what doesn’t work when rebuilding a collegiate club. A reoccurring theme was the importance remaining mindful that the college club is the student’s club and students need to drive the direction of the club and what events it will pursue. The role of the faculty advisor is to facilitate. W1YU President Scott Matheson, N3NFP, moderates the round table discussion. W1YU congratulates Scott for passing Element 4 and earning his Amateur Extra at Boxboro! 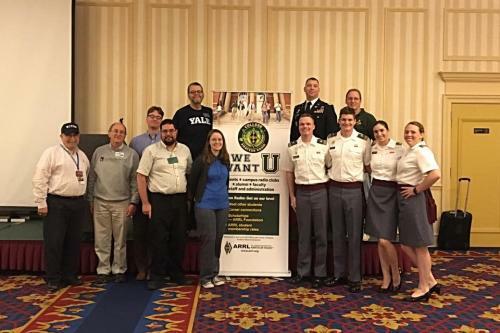 W1YU extends a special thanks to our co-presenters from CWRU, MSU, West Point and Harrisburg who made the sacrifice to join us at Boxboro and thanks to everyone else who helped make the second New England CARI Forum a success - see you in 2018! Dr. Edward Snyder, W1YSM, Scott Matheson, N3NFP, and Peter J. Downhour, N1PJD enjoy a laugh at the Saturday evening banquet.